We love making novelty vodkas for gifts and for ourselves, whether it be chocolate, fruit or sweet based. Some of my favourites so far have been Werther's Originals, Mars bar and chilli! I'm keen to make myself some vanilla vodka and, while it's quite a simple creation, would love to know if anyone's got any tips or tricks to make it extra special? Also has anyone tried any other flavoured vodkas which have worked particularly well? Rasberry vodka is to die for. I dropped a litre bottle of this a week or so ago and wanted to cry! Generally we have the same amazed response to. Sloe gin is good but raspberry vodka is almost divine. We now have two bottles of raspberry vodka. One from the Summer and one with Autumn raspberries. All raspberries picked on site. There are masses in the freezer so I'm thinking of investing more in future tipples as I don't have quite enough for wine. Some of my favourites so far have been Werther's Originals, Mars bar and chilli! Oh goodness me, Jet_fusion. I think the generation gap is showing here big time! Have you ever tried bubble gum gin? Let us know if you survive! Aw. I was hoping to find some vanilla vodka suggestions here. I've even bought the vanilla pods already, and now instead I'm just thinking about raspberry vodka. 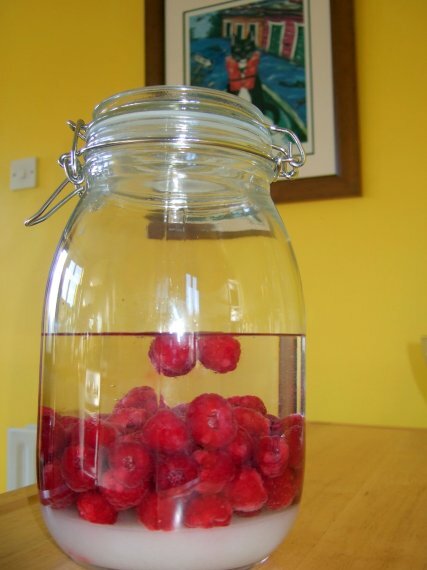 Inspired by a bargain raspberry find on Thursday's shop I started off some of Fiona's Patented Raspberry Vodka this morning. Looking forward to tasting it in 3 month's time! Flavoured vodkas huh? How would you like to "taste the rainbow........?" Yuck to the Skittles vodka, all those colours would make me ill. I watch Grow Your Own Drugs a couple of weeks ago and James Wong made moth repellent using wormwood, sage and rosemary. We have a bit of a moth problem so I thought I'd give it a go. We already have sage and rosemary in the garden so I bought some wormwood seeds. Now you can guess what I'm thinking about... I wonder whether it's possible to make home-made absinthe. I found a couple of recipes on t'internet but since the plants are only about 1cm high (they only hatched at the weekend ) it's a bit too soon to be starting.